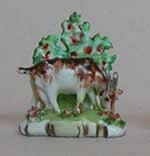 Cow standing on white base with flower bocage at back, stance of cow may vary from that pictured. Goat on base with flower bocage, Goat stance may vary from that pictured. Horse on base with flower bocage at the back. Horse color and stance may vary from that pictured. 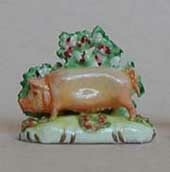 Pig figure mounted on white base, flower bocage at back, pig stance may vary from that pictured. 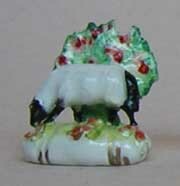 Sheep is stood on white base with flower bocage at back. The stance of the sheep may vary slightly from that pictured.